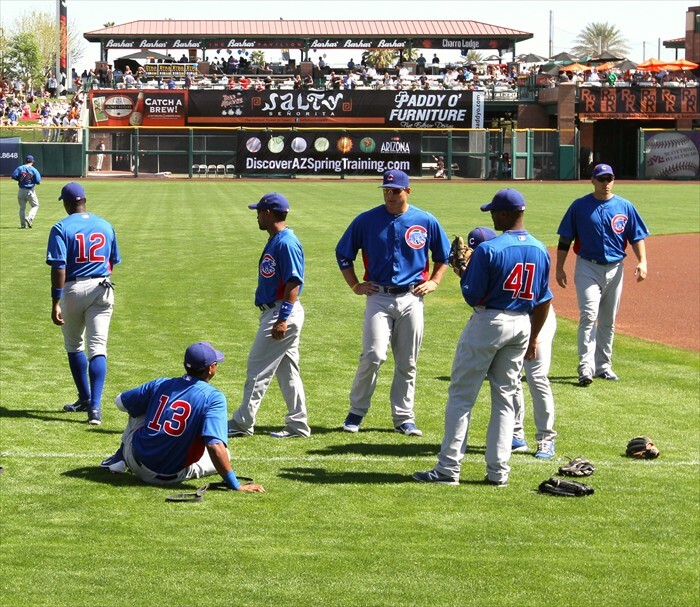 If you saw the BOS Facebook page this morning you knew I was headed up to Scottsdale for the Cubs vs Giants game today. 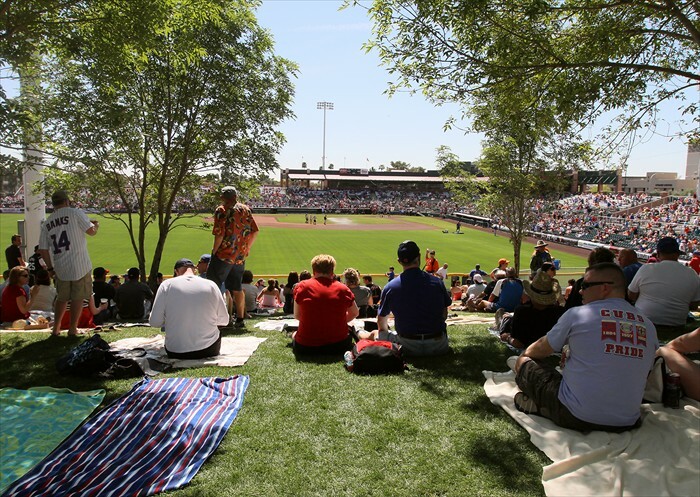 These road games, if you can call them that (it’s a whole 9 miles from Hohokam to Scottsdale Stadium) are especially fun for me as I get to just be a fan and enjoy the spring training game experience. I truly love doing the public address announcing for the Cubs at Hohokam Stadium but that is a different experience than just a fan chilling at a game. Today I went with my brother and 14 year old nephew, who is on spring break. My brother picked up the tickets, so I wasn’t sure what to expect as far as seating. 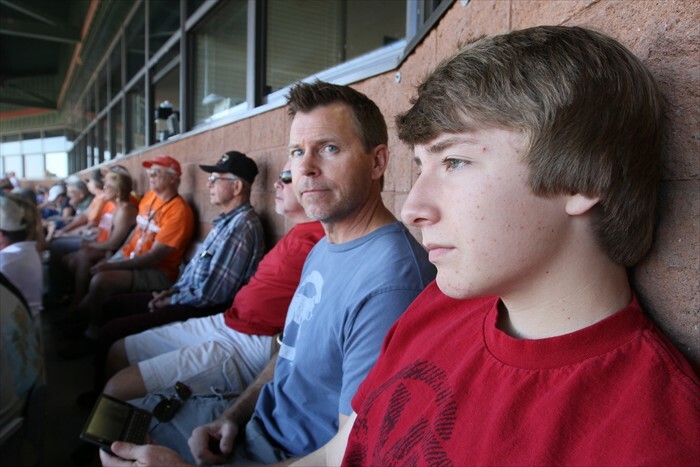 Seems I can’t get away from the press box as our seats were the back row that backs up to the Scottsdale Stadium press box. As is the case with some of these smaller spring stadiums, a seat on the back row can get you a view into the press box. 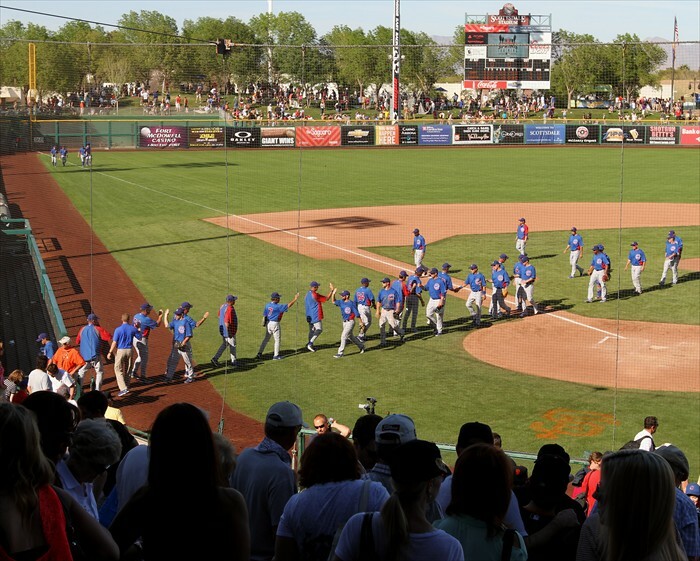 As we walked down our row, I spotted the Scottsdale Stadium PA announcer as he was going through the starting line-ups. I snapped a photo of him and he gave me a what the heck are you doing glare. Our seats it turned out, were right below Len Kasper’s broadcast booth. On top of Len’s Cubs duties with WGN and Comcast he is working with Mick Gillispie calling the spring games on Cubs.com. 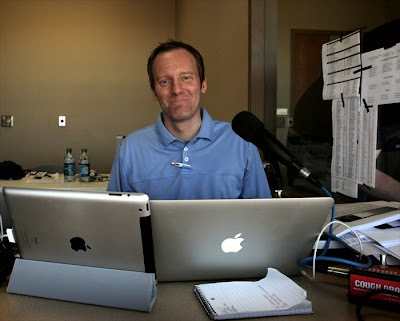 Mick is the voice of the Tennessee Smokies (the Cubs Double-A team). Besides getting to say a quick hello to Len, the other advantages of these seats were that we could hear Len and Mick’s broadcast and also have the air conditioning from their booth cool us. As for the game, it was a fun one. The Cubs had a 5-1 lead, only to have the Giants comeback to within a run. 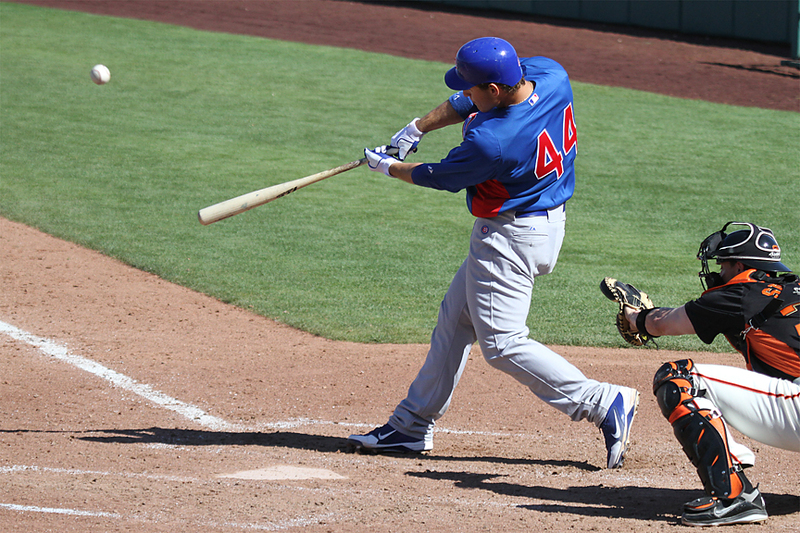 Alberto Cabrera pitched the 9th and had 2 runners on base before notching the final out and a 5-4 Cubs win. 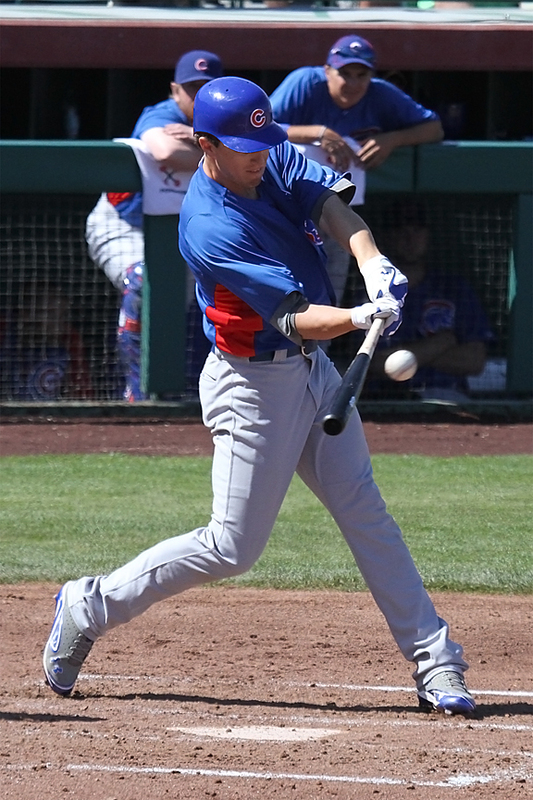 The Cubs had 13 hits from 13 different batters, with big ones from Anthony Rizzo who recorded his first Cubs home run, and Josh Vitters’ RBI triple. 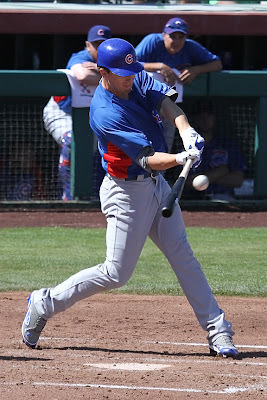 Starting pitcher Chris Volstad chipped in with a hit and run scored, while Darwin Barney and Starlin Castro each had RBI singles. 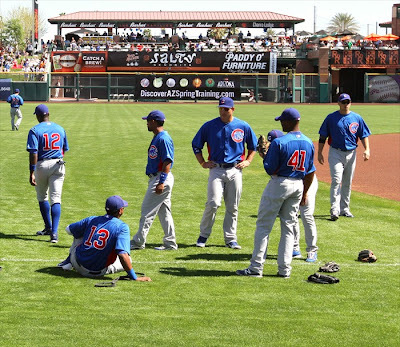 The Cubs also hit 4 doubles (Mather, DeJesus, Soriano, Cardenas) and Dave Sappelt had a triple. Chris Volstad started and pitched strong again, tossing 3 shutout innings allowing 2 hits with a K. Andy Sonnanstien had a difficult inning pitched, giving up 3 runs on 5 hits. Anthony Rizzo’s HR was a no-doubt bomb over the Giants bullpen and into the Salty Senorita tent deep in right field. I hope it’s the first of many in Cubs blue for the 22 year old first baseman. Starlin Castro and Brett Jackson each had a stolen base. I didn’t take notes during the game and really just enjoyed family, baseball, sun, and fun. We had a nice conversation with a family in front of us who currently live in Miami FL, but are excited to soon move back to the Windy City. My nephew Connor is like many 14 year old boys, low key and too cool to get excited about much. He plays a lot of baseball (tournament and traveling teams) and like many kids his age has aspirations of one day being in the big leagues. Only time will tell if Connor has what it takes for the Bigs, but after we got home to my brothers house, he admitted he had a good time today. Another fan in the making. Hey Man, Can I Get a Hug?